Monolithic yet malleable – the towering chassis was built to adapt, integrate and realize your gaming and mega-tasking needs. The liftable top metal mesh and effortless, removable side panels give you the kind of case that PC builders dream of. Next up – modding! The EMI compliant, see-through side panel is beautiful to behold (thanks ARGB + RGB lighting) and has the added benefit of reducing incoming electromagnetic interference. Forged into the front of the chassis are four Predator-styled ARGB light bars. So give some of our more complex patterns a go as the LED bars illuminate in a vivid spectrum of color. Pick a pattern that fits your style or one that melds with your game of choice. LEDS, light strips and case fans, tucked away within the hardened shell, can go full-on 16.7 million colors. Audio engineers and lighting enthusiasts rejoice! Music Mode, aka Lighting Maker, allows you to fine tune your lighting with a song of your choice. Show off your skill and upload it for all to see. Eight* DIMM slots are just the beginning. 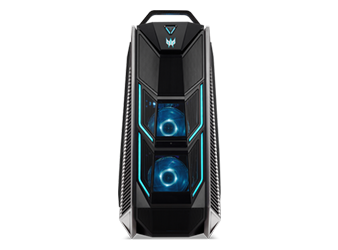 This machine was built to grow – to expand – to become the bastion of mega-taskers and veteran gamers alike. Let’s be clear: you have options. With up to SIX drives in total your best solution is four 2.5” SSDs and two 3.5” HDDs—all neatly mounted out of sight for that extra clean look. Depending on your graphics setup, you’ll still have space for something extra thanks to the four* x16 PCIe slots. Pop in another video card…slot in a PCIe SSD…you’ll make it work! Nestled in amongst a gathering of ports is the easily accessible “Turbo” button. If you have a need for speed, this may cater to your overclocking cravings.